Outbound (From DTC) to Routes 6, 7, 10H, 11, 12, 13, 20 & 22: Regular route to Superior Street and Lake Avenue then detour via left on Lake Avenue to 2nd St., right on 2nd St. and back to regular route. 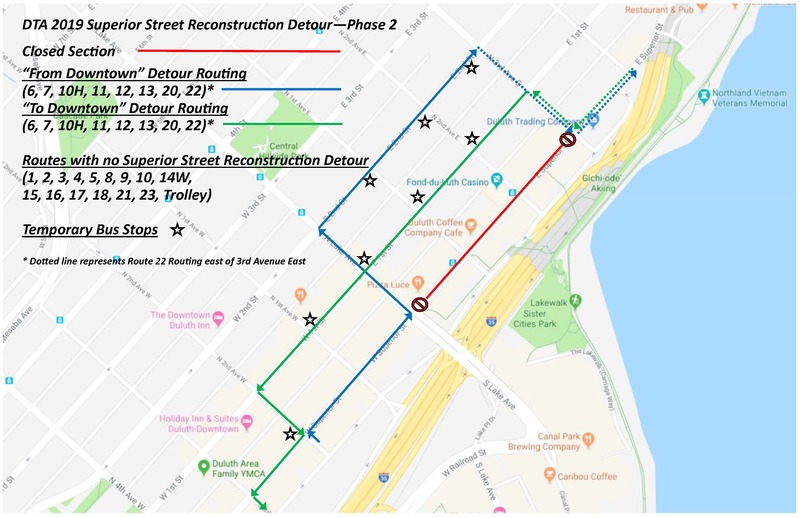 Route 22: Detour routing to 2nd St. and 3rd Ave. E. then down 3rd Ave. E. to Superior Street and back to regular route. If you would like more information on this press release or to schedule an interview with DTA General anager, Phil Pumphrey, please contact DTA Director of Marketing, Heath Hickok, at 218-623-4314. The DTA’s mission is to provide a public transit service that is safe, convenient, efficient and affordable. It has been providing reliable service to the Duluth area for more than 138 years. 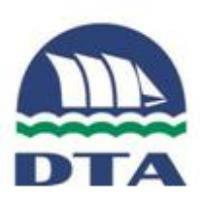 The DTA has over 150 employees and a fleet of 70 fixed-route buses that provide service throughout the Twin Ports. The DTA Operating Center is located at 2402 West Michigan Street, Duluth, MN 55806 and the Duluth Transportation Center (DTC) is located downtown at 228 West Michigan Street, Duluth, MN 55802.